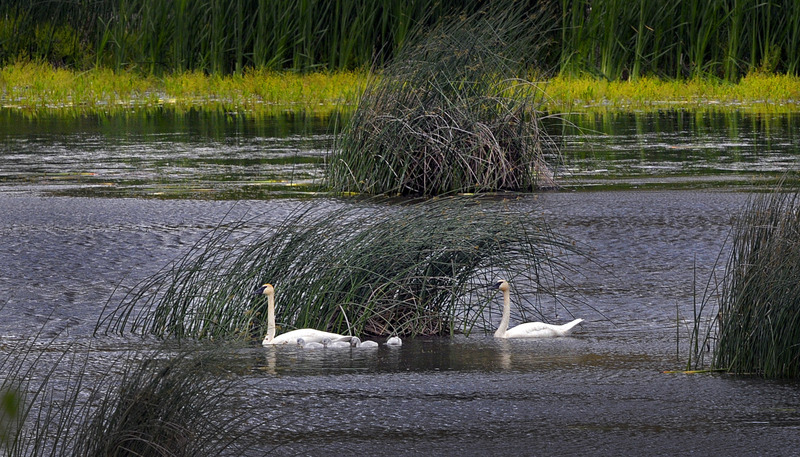 The drought is over for a geriatric but persistent trumpeter swan who has sired the first cygnets to be born at Turnbull National Wildlife Refuge since 1987. Four grayish-white puffballs hatched in a trumpeter swan nest near the refuge’s headquarters south of Cheney, apparently over Father’s Day weekend. The father, an elegant male trumpeter nicknamed Solo, may be the refuge’s oldest seasonal wildlife resident – and one of the oldest trumpeters documented anywhere among his rare species. After his original mate was killed on their nest by a predator in 1988, Solo returned year after year to defend his territory. He attracted a few female swans to the refuge, but their relationships never yielded offspring. Mike Rule, refuge wildlife biologist, said he’d feared Solo had simply grown too old to procreate. While trumpeters are known to live 20 to 30 years in the wild, wildlife officials believe Solo is between 33 and 46 years old, Rule said. “He had a mate with him this year, and we’ve been checking them regularly since we found her sitting on a nest at Cheever Lake about a month ago,” said Nancy Curry, refuge manager. “I had checked on Friday and saw her with no movement around the nest,” Curry said Monday, after “getting a feeling” that she should go check the nest again. With Solo on guard just a few feet away, the mother led her cygnets off the nest and into the water. “They already had a little size to them, but cygnets can go into the water within a day after they hatch,” Curry said. Males swans, known as cobs, are attentive parents. “They will sit on the eggs when the female needs to feed and they stick around to raise the cygnets,” Curry said. Solo’s life has had its share of drama. He fathered up to a third of the 122 cygnets known to have hatched since trumpeters were introduced to Turnbull in the mid-1960s, Rule said. Trumpeter swans pair for life, but if a mate is killed, they often look for a new companion. While Solo still had the vinegar to defend his territory and the swagger to attract a few mates after his first mate was killed, his breeding attempts had been unfruitful for 22 years. “He’s an interesting bird, and we still don’t know exactly where he goes for winter, although judging how quickly he’s here every March at ice out, it’s probably not too far,” Rule said. Trumpeter swans, named for their distinct trumpet-like call, are the largest native waterfowl species in North America. Family groups usually remain together, but only through the first winter – so next spring’s chapter in Solo’s drama could deliver even more surprises.